Pandora bracelets and charms have surged in popularity the last few years, replacing traditional dangling charm bracelets with large hole bead charms. And there are several other companies that manufacture similar styles such as Trollbeads, Ohm, and Chamilia to name a few. If you've been shopping at your local craft store, you've probably noticed economically priced similar large hole beads and charms available there too. I purchased a large assortment from my craft store - but I was disappointed by that I either needed clips to keep the beads in place or need to fill the bracelet with charms to keep everything in place. My solution is the same as it usually is - I'll make my own charm bracelet! I had a few important criteria for the bracelet to hold my large holed bead charms. It needed to hold the beads in place without bead stoppers, the beads needed to still be interchangeable, and it needs to be fun and hopefully a little more casual than the regular Pandora bracelet. I decided a spiral half knot macrame bracelet would be perfect. I used 1 mm bamboo cord for my bracelet. If you've never done macrame, this is the perfect place to start since it is the easiest stitch. In order to make the bracelet interchangeable, I attached the cords to an 18g 4mm jump ring that I made sure fit through my large hole beads. Then I used my homemade macrame knotting frame to hold and stitch the project. I did half square knot (spiral stitch) for 6 inches to make the bracelet. This is one of the biggest differences from making a regular bracelet. You need to make sure the bracelet is going to still fit your wrist once you put the desired number of beads on it. This will depend on the number of beads you will typically wear on the bracelet. Don't underestimate the size of the beads. Lucky for me - with cotton cord, there is a little stretch built in. Another key component of this bracelet is the two way clasp. The clasp is two ways because it has two clasps and can be attached or detached from either side. 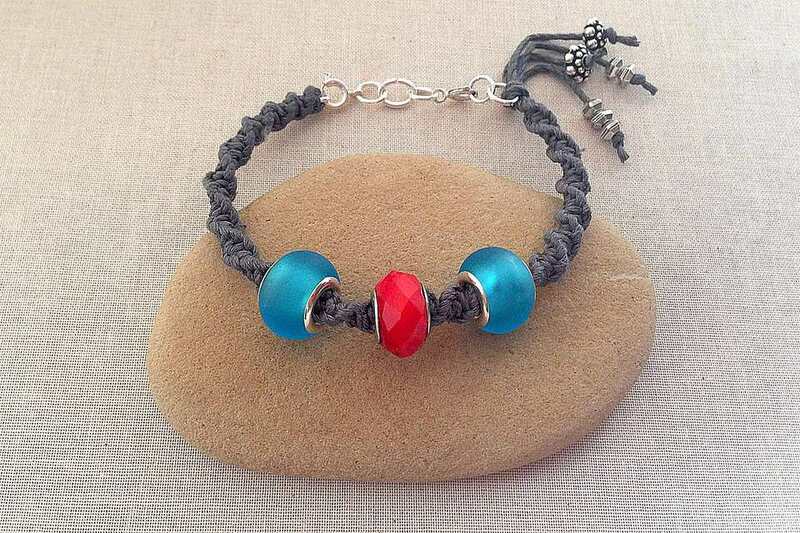 One side of the bracelet has the small jump ring that can be used to add or remove beads. The other side has a larger jump ring that makes it easy to put on or take off the bracelet. Without the two way clasp, the bracelet would be frustrating to wear daily because the small jump ring would make it very hard to clasp. I use several jump rings to space the clasps. This has two functions. First, it helps the clasps lay flat at the bottom of your wrist. Second, it visually separates the clasp making it look more like an extender chain and less like multiple clasps. Finishing the working side of the bracelet is also important. You are working with four individual cords and it's important that they are tied securely. Making them decorative is also a plus. I used a larger 5mm jump ring to thread the cords through and tie a simple overhand knot with the jump ring inside, pulling the cords down and away from the bracelet. Then I trimmed the thread ends leaving enough room to add beads and more overhand knots. Slipping the beads on the cord for fringe can be difficult. If the cord wants to unravel, dip the ends in white glue to make a stiff end that can be used like a needle to thread the beads. Tie an overhand knot underneath the beads to keep them in place and trim the string ends. You can add a drop of glue to each knot to make sure they are secure. I use crazy glue. Your bracelet is ready to be worn or have the beads changed. Depending on the material and thickness of your cord, the macrame bracelet can become lightly frayed when you change the beads. You can limit the amount of abrasion by twisting the beads on the macrame braid, similar to threading a nut on a screw.